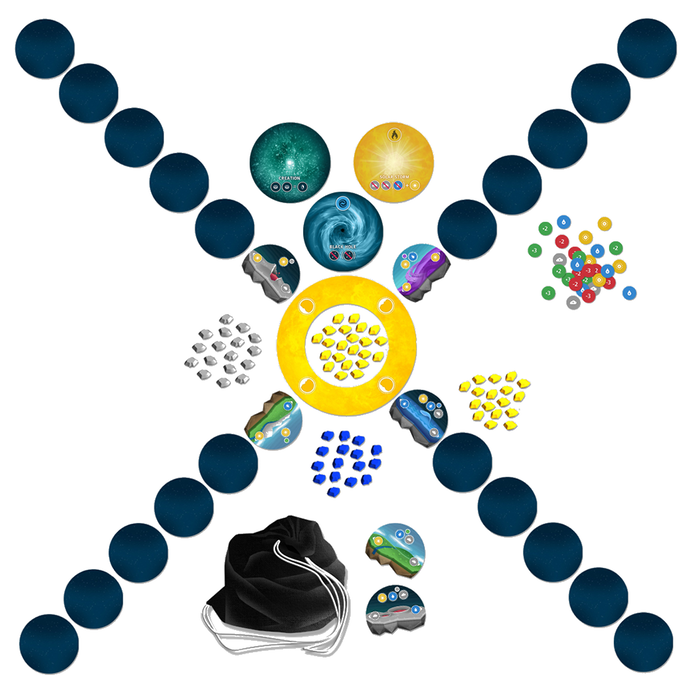 In Exoplanets, players work to contribute to the development of a solar system. 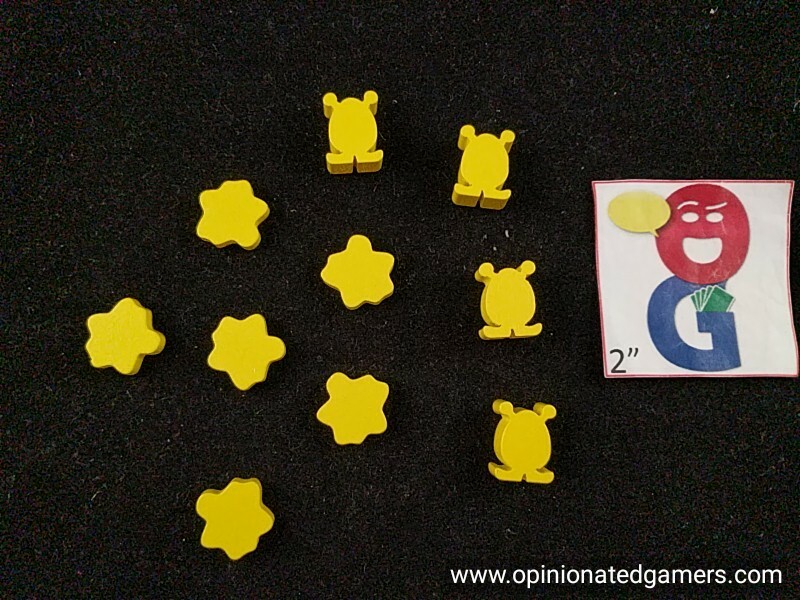 At the start of the game, the central star tile is placed in the center of the table and an appropriate number of energy markers is placed on it (5 per players). Four planet tiles are then placed in the nearest orbit around the star. Each player takes their color of life markers and species markers. Each player also gets 3 Space Tiles and chooses two to keep. The Space Tiles can be used to score victory points for meeting certain Goals though they can also be used for one-time effects. Three Special Effects tiles are placed near the edge of the playing area. Players take turns in order, and in a turn, each player goes through two phases before play passes to the next player. The first phase is the birth of a planet and the second phase is evolution and resolution of those effects. 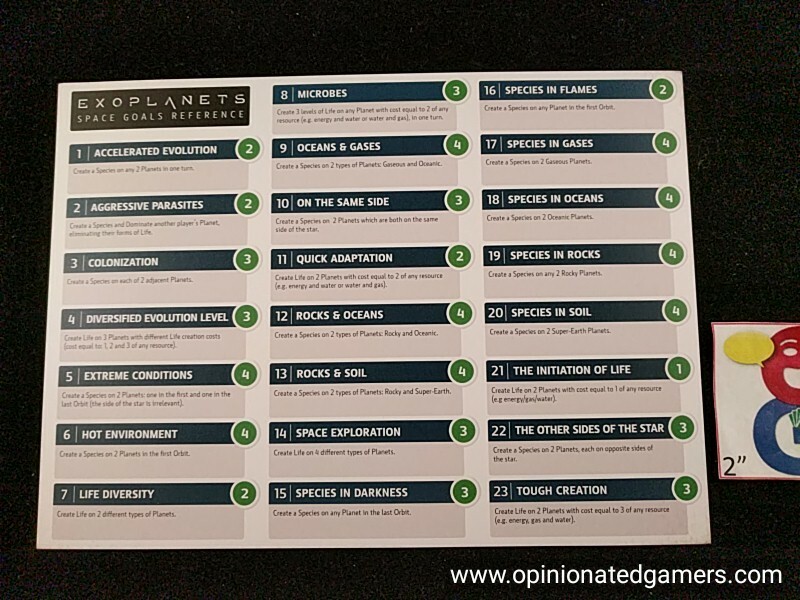 To place a planet – you first have to choose the Planet Tiles. You can either draw 2 tiles from the tile bag or choose either of two tiles that is face up on the two stacks that are always available on the table. You can only play one planet per turn, so if you draw from the bag, you will end up placing the unused tile on top of one of the two stacks. You then place the Planet tile in any space currently occupied by a Space Tile. The Space Tile gets placed in your hand. The Planet tile must be added to any side of the Star Tile and must be played adjacent to an existing Planet tile AND must match the neighboring tile in alignment. Then you collect your resources. You always get one Energy Marker from the central star for placing a planet. Then, you look at the planet you just placed, and you will get resources matching the now adjacent icons on the new planet and the existing one which it neighbors. Then in the second Phase, you can take any number of actions in whichever order you like: Creating and advancing Life, achieve Goals on a Space tile, use the one-time special ability on a Space tile, activate a special effect tile, and gain Stimulation Markers. I’ll explain each option below. Creating Life – Each planet tile has a cost to create or develop life at the top of the tile. If you pay the cost, you can add a Life Marker of your color to the planet. If you are about to add your fourth Life Marker, you instead place a Species Marker in your color onto the planet. You cannot go from level 0 to level 4 in a single turn. Any number of players can have Life Markers on a planet, but once someone places a Species Marker, all other players must remove their Life Markers (though they will get one resource per Life Marker in compensation). No further Life Markers can be placed on a planet that already has a new Species on it. There is no limit to the number of planets that you create life on – so long as you have enough resources to pay for the life creation, you can do it. 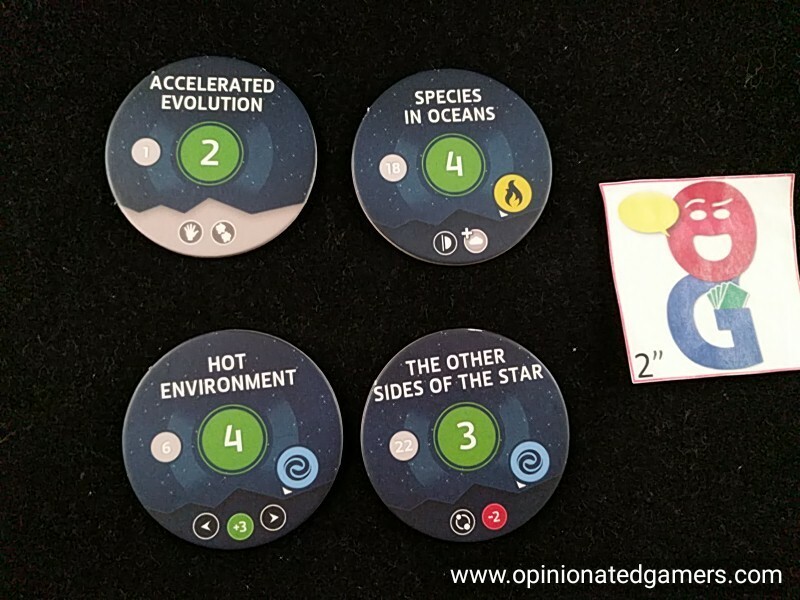 Collect Stimulation Markers – you gain 1 Stimulation Marker (taken from the Creation Special Effect tile) on a turn for EACH different planet that you create life on in that turn. This could lead to the Activation of the Creation Special Effects Tile – see below. Use an Ability – As I just said, Space Tiles also have abilities on them. You can use a grey one-time effect immediately; the tile is discarded to the box after the effect is resolved. A blue tile is a Permanent effect that is applied to a planet. The blue Space Tile is placed under the planet to show the effect. A planet can only have ONE modifier played on it. Some of these abilities have an icon on them which cause you to draw a Fusion token from the Black Hole tile or to draw a Solar Flare token from the Solar Storm tile. Activation of the Creation Special Effects Tile – if the eighth and last Stimulation Marker is removed, all players return their Stimulation Markers and each gets one resource of their choice for each pair of Stimulation Markers. Players receive nothing for a single Stimulation Marker. Activation of the Black Hole Special Effects Tile – if the fourth and final Fusion Marker is taken, all players who have those Fusion Markers must return them to the Black Hole tile. These players must also discard 1 Space Tile from their hand per Fusion Marker returned. Activation of the Solar Storm Special Effects Tile – When the fourth and final Solar Flare marker is removed from the Solar Storm tile, all players must return their Flare Markers to the board as well as two Gas Markers per Flare Marker returned. Further, the player who returned the most number of Solar Flare Markers must also return an additional Water Marker to the board. Once you are done taking all the actions that you wish to take, your turn ends and the next player in order now starts their turn. The game ends when the final Energy Marker is taken from the central Star Tile (This is after all players have had 5 turns). The game then moves into scoring. First, you score creation points for life created in the solar system. Each Life Marker has a base value of 1 VP, and each Species Marker has a base value of 5 VP. These values are then multiplied by the number of resources required to place a Life Marker on that planet. Then take into account the modifier tokens which may have been placed on this planet (though you can never score less than zero for a planet). You also score points for all goals that you have achieved. The player with the most VPs wins the game. Ties are broken by the player who has created the most Species and then secondarily by the player with the most Goals fulfilled. 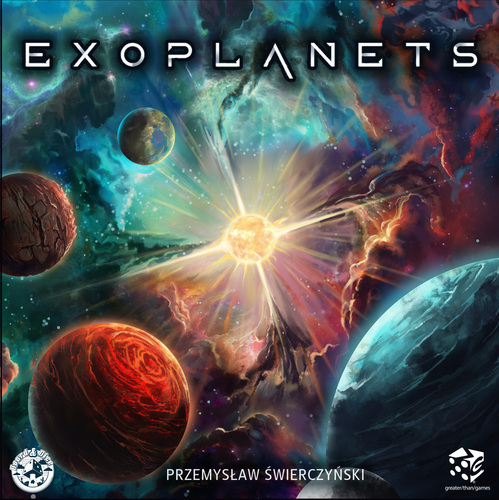 Exoplanets is a game where the players build their cross shaped solar system from the central sun. You’ll have to suspend your disbelief about how gravity works in terms of planetary orbits because I’ve never read of any system that has four planets in each orbit around the central star. But, that aside, the game challenges you to play your tiles well by placing Planet tiles in strategic locations where you can get the most advantage out of them. Due to the placement rules, we seem to be drawing tiles from the bag more often than not. In the second phase, you have a plethora of options to choose from. You can create life, and you have to decide where to do it. Be careful not to get caught out when someone else makes a new Species. Sure, you get resources as compensation, but it’s a big loss of points when your life markers are swept off the board. Be sure to look at your Space Tiles – the winning player is the one who can best figure out how and when to play them (or to save them as Goals). 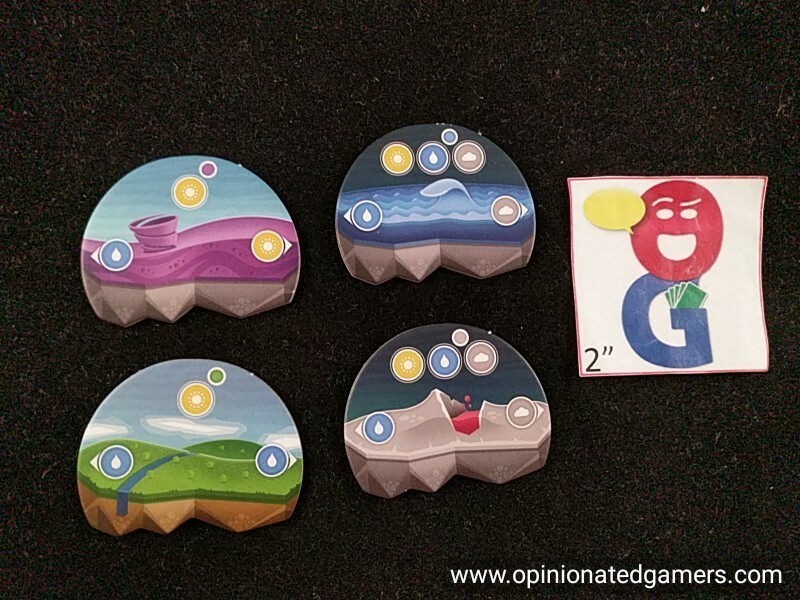 The game components are all language independent, and while this is normally a good thing, in this game – this format really has slowed down our initial games. All of the icons are explained on a two-sided player aid board, but it has taken us a long time to continually cross reference the icons and their explanations on the board. Luckily, the title of each space tile is in large print, so you can find it on the player aid. For me, as the tiles can be both actions and goals, it takes a while for me to process all my options so I can figure out what is best. Sure, I can do some of this in the time between my turns, but as the board changes with each player’s turn, it’s hard to formulate my final plan until I can see the current state of the solar system when my turn rolls around. It’s important to note that each player is only going to get 5 turns. You don’t have a lot of chances to choose actions to score points. You have to make each of your turns count as best you can. It seems like the best strategy is to place your Planet tiles in the locations where the useful Space Tiles happen to be. Of course, as those are all face-down, this is a giant crapshoot. While the actions are pretty strong, getting the Black Hole token Space Tiles is a double edged sword. The penalty of the Black Hole is severely punishing. It often causes the stricken players to lose all the Space Tiles that they are holding onto. When you only get 5 total in a game, this is a huge penalty. Sure, a skillful player will see what is coming and figure out how to mitigate the penalty, but this is easier said than done. Part of me would like to have a few more turns in the game because five sometimes doesn’t feel like enough, but on the other hand, our games have been long enough that we’re ready for the games to end by the fifth round. The current length of our games is easily 2 or 3 times more than what the complexity and content of the game would need. This feels like a game that would be better suited to a 15 to 20 minute filler, and in our group, we haven’t even come close to that sort of time frame. 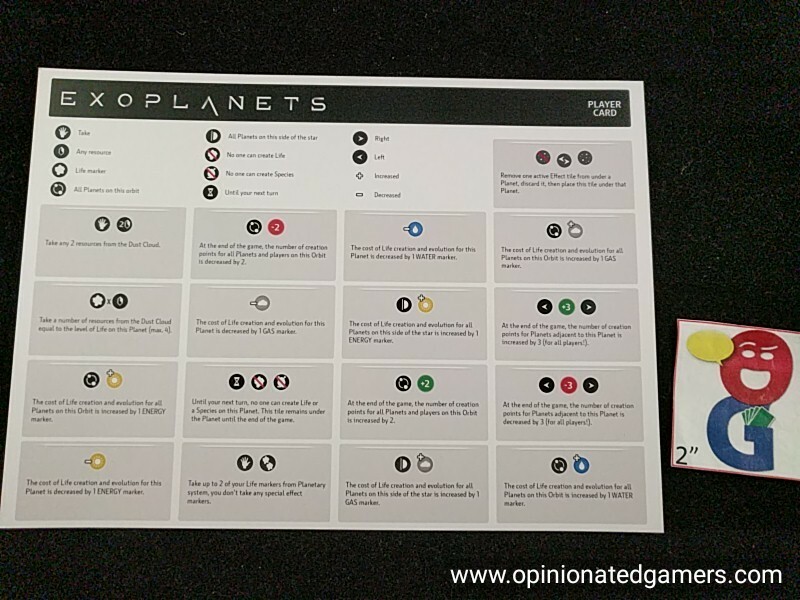 Exoplanets is a game that has an appealing theme (at least for me) – as the idea of space exploration combined with tile-laying both appeal to me. All of the mechanics work in the game, though I wish that the goals on the Space tiles were represented in more than just a number that refers to the player aid. The box claims games take 45-60 minutes, which should be a pretty quick pace – but in reality, our first games have taken (and felt) quite long and ended up not being a great experience. This might improve with a few more games (and I become more comfortably with the tiles/icons), but after the first two games, I don’t know if that will happen. Mitchell Thomashow (1 play): I bought the original Kickstarter as the theme seemed enticing. However, I found the game play inelegant and clunky. Although I’m not one to get hung up on theme, I thought that the designers missed a chance to use a highly original theme in interesting ways. Clearly, alot of love went into the lovely production, and there is some potential here, but the game is overly complicated for what is really a simple, luck-based tile placement affair. I’m always hesitant to pan a game after just one try, so I’m open to the possibility that I missed something. But with so many interesting games beckoning, why go back?